LeviLowry.com: Something Beautiful is Going On In Rowlett! Something Beautiful is Going On In Rowlett! Something beautiful is happening in Rowlett! This "something" has been in the works for quite some time. For the better part of six years, many of the local pastors have met on the first Tuesday of each month to share a meal, share their hearts, and pray for the community in which they serve. Full disclosure, I am part of this group but I wasn't so quick to embrace these guys and gals. To say I was hesitant would be a heinous understatement. 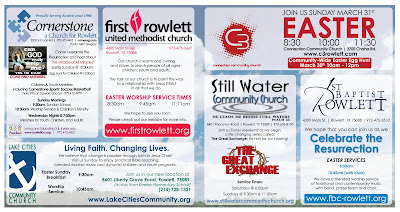 I had moved from North Carolina to Rowlett to start/re-start a church with a group of 12 or so local folks. I was of the mindset that we needed to stay to ourselves and carve out our niche in the community and not get "lost in the crowd" of local churches. Honestly, I had never known a bunch of pastors to get together to pray and share life; the good, bad, and ugly with each other. The catalyst behind the group was a local pastor named Kason Huddleston and he kept bugging me to come to these lunches and meet the other pastors. He was relentless with his invitations and I finally caved-in and told him that we would participate in the annual Community Thanksgiving service. Have you ever attended an event to end the invitations of a persistent friend or neighbor? Yeah, that was me. We gathered on that chilly evening to give thanks as the combined churches of Rowlett and to my surprise, it was... beautiful! Baptists, Methodists, Nazarenes, Pentecostals, and a variety of others joined together and raised our voices to sing songs of thanks. We prayed prayers of thanks. It was far from the smoothest or flashiest service, but it changed me. I began to let my guard down and trust that it might be a good thing to "live life" with this group. I began making the Tuesday lunches a priority and participated in the community services without fail. It wasn't long before I had laughed, cried, hurt, and hoped with these folks. In the Fall of 2011, after months of planning, we pulled of “Cover Rowlett”. The churches united and literally walked in front of, and covered every home in Rowlett with prayer. Stillwater Community church has invited three other churches use their facility in order to get started. First Baptist Church has helped at least two churches with significant financial gifts. They gave Catalyst Church enough money to buy a nice communion set as well as the equipment needed to broadcast services online. 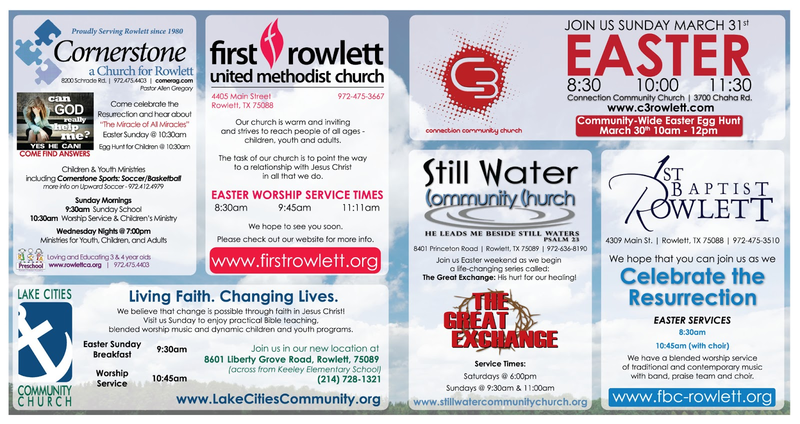 Four churches recently contributed financially to Lake City Community Church as they bought property and a building. A couple of the churches making contributions are situated within a stone's throw of Lake City's new location. Did you catch that? Local churches with no affiliation other than close proximity, have been working together for years to support and give generously to one another. A question that we have struggled with as a group in the past few months is, "Now that our churches know we are on the same team, how can we inform the whole city that we are united in our care for Rowlett?" 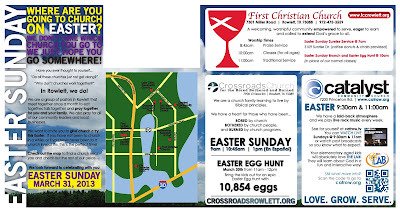 At our last monthly lunch, the idea to send out a multi-church Easter Ad sponsored by multiple churches was pitched. A huge color piece that would land in every mailbox (18,000) in our city and let each resident know that: we care for them as a faith community. We don't care which church they choose to attend, we simply hope they will attend one. The result was a variety of voices... men, women, young, and old responding with a variation of "We're In!" Seven churches were on ON THE SPOT! Another church wanted to participate but didn't quite have the funds. 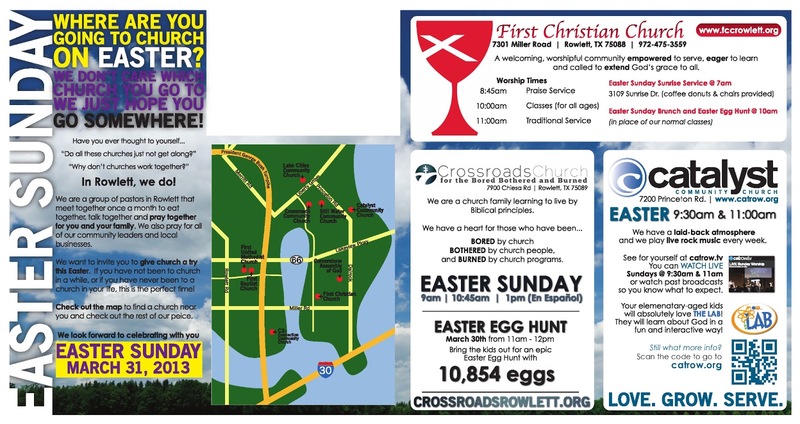 It came as no surprise that several other churches were willing to make up the difference so that we could begin getting the message out that something beautiful is happening in the Rowlett faith community. Just before posting this, I got word that the total is up to NINE churches. I am so grateful to do ministry in Rowlett with a bunch of pastors that “get it”. Maybe you are a skeptic of church like I was a skeptic of this group of pastors. I honestly believe that if you give a local church a chance, you will be surprised with the beauty of what you find within. The blank spot is where the addresses will be placed..
Click the Picture for better quality. I'm proud that our town pulls together in the name of God and our community. That's what Christians should do. We are all here to serve the same purpose anyway. On the flyer attached on the blog, it is unfortuante though that whoever made the map of the churches didn't do a very good job. If someone chose C3 to attend, they would be on the wrong side of George Bush looking for that church and would have a VERY hard time finding it!! And anyone who chooses First Baptist or Methodist would be confused and backwards on which on is which if they don't pay close attention to the actual sign on the church as they walk in. Actually, it was mostly corrected. The c3 location is still off but our guess is that most people will look for directions on Google or through the church website rather than a vague map.